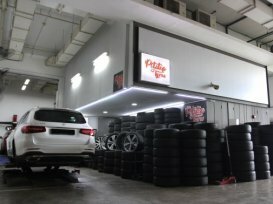 Pitstop Tyres Pte Ltd has moved to a bigger premise to serve their customer better. Currently situated at Shell Peirce (551 Upper Thomson Road Pitstop), Tyres Pte Ltd is a High Performance PCR tyre and ALLOY SPORTS rims retailer. They provide Tyre and wheel replacement for most European and Japanese cars. They only use NITROGEN air fill for all new tyres! Tuner sizes from 15, 20, 65-30 series profile tyres are available. All tyre and wheel fitment machines are latest from ITALY. Capable of up to 24? tyre fitments! Fitment is done by our highly experienced Tyre Techs. We carry a wide variety of tyres brands like Goodyear, Dunlop. Michelin, Yokohama, Pirelli, Continental, Falken, and Federal performance series tyres! Car batteries from Bosch are also available.